South Africa is to change the name of its capital city, Pretoria, to Tshwane, as part of a move to make place names more African. Pretoria was named after Andries Pretorius, a folk hero of the Afrikaner group, which set up apartheid. 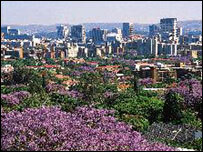 Tshwane, which means "We are the same", is the name given to the area by early African groups. The switch has been voted for by the local council. If approved, the city centre would still be called Pretoria. The African National Congress dominated council wants the entire metropolitan area, with some two million residents and also comprising other towns, to be given city status, with the name of Tshwane. Under the plans, the Union Buildings which house many government offices, would fall outside the boundaries of Pretoria. The South African Geographic Names Council is expected to approve the change when it meets in October. The process of changing the city's name on maps would then start. An international marketing campaign would then be started to make people aware of the new name. "By embarking on this process and project of transformation, our country is making a clear distinction between the old and the new, the past and the present," Executive Mayor Smangaliso Mkhatshwa said during an acrimonious four-hour debate. The opposition Democratic Alliance, which has strong support among whites, said the 1.5 billion rand ($256m) the switch would cost would be better spent on improving services. It also argued for the continuation of the current compromise - retaining Pretoria as a city within the Tshwane metropolitan area. DA councillor Derek Fleming said the new name had "less substantiation behind it than the mythical island of Atlantis".